Brewer's yeast is made in one of two ways. Dr. Michael Murray says this type of fungus is grown on grains (such as barley) during beer making or on sugar beets to boost nutritional value and provide a sweet nutty flavor to make dietary supplements. With the right nourishment, Saccharomyces cerevisiae fungi (the fungi in brewer's yeast) grow and produce millions of offspring. Brewer's yeast is often classified as nutrient-rich because it is typically grown on nutrient-dense foods, and Saccharomyces cerevisiae fungus can manufacture vitamins and amino acids (building blocks of protein). The University of Maryland Medical Center says brewer's yeast is a good source of protein, chromium, selenium, and B-complex vitamins (vitamins B1, B2, B3, B5 (pantothenic acid)), B6, B7 (biotin), and B9 (folic acid) but lacks essential vitamin B12. Brewer's yeast is a complete protein, containing all essential amino acids. Brewer's yeast has proven to be effective for blood sugar control and diabetes management, according to the University of Michigan Health System. This is because it is rich in chromium, which is beneficial if you have glucose intolerance. One 2013 study published in the International Journal of Preventative Medicine found taking 1,800 milligrams of brewer's yeast (as a nutritional supplement) daily for 12 weeks significantly improved blood sugar control in patients with type 2 diabetes. Taking brewer's yeast supplements may even aid in healthy weight management. According to the University of Maryland Medical Center, some studies show chromium in brewer's yeast slightly reduces body fat, and protein in this yeast boosts satiety, which could help you cut calories. However, more research is necessary, and brewer's yeast isn't a substitution for healthy diet and exercise regimens. Do you struggle with acne and are seeking natural remedies? Consider talking to your doctor about brewer's yeast supplements. Mayo Clinic says one strain (CBS 5926) appears to help clear up acne. This could be because the yeast offers antimicrobial properties, according to Herbal Treatment for Dermatologic Disorders. Adding brewer's yeast to your diet regimen may help lower your risk for developing heart disease by improving blood pressure and cholesterol levels. One 2013 study in the Iranian Journal of Public Health found taking 1,800 milligrams of a brewer's yeast supplements daily for 12 weeks significantly lowers diastolic and systolic blood pressure. Another study published in 2012 in the Journal of Diabetes found that taking 12 tablets of 300 milligrams of chromium-rich brewer's yeast daily for eight weeks lowered low-density lipoprotein (LDL) cholesterol and triglyceride levels but improved high-density lipoprotein (HDL) cholesterol, which is the healthy form of cholesterol. Brewer's yeast might help boost your body's immune system by altering intestinal bacterial balance. This may help relieve infectious diarrhea. The University of Michigan Health System says supplementation helps fight diarrhea caused by a type of bacteria called Clostridium difficile. The University of Maryland Medical Center reports brewer's yeast may even help prevent flu and colds. However, more research is needed to know for sure. As with all dietary supplements, potential risks and side effect are possible when adding supplements to your meal plan. Mayo Clinic suggests brewer's yeast causes flatulence. It can interact with certain medications and should be avoided in people with frequent yeast infections. Chat with your doctor before taking brewer's yeast supplements if you have diabetes or Crohn's disease and only take such supplements under medical supervision, warns the University of Maryland Medical Center. Does Brewer's Yeast Contain Gluten? This product generally contains gluten, but in some cases it may not. Registered Dietitian Lola O'Rourke says brewer's yeast that is a by-product of beer-making contains gluten, but brewer's yeast grown on gluten-free mediums (like sugar beets) could be gluten-free. Check the nutrition facts label to be sure. Should You Consume Brewer's Yeast? 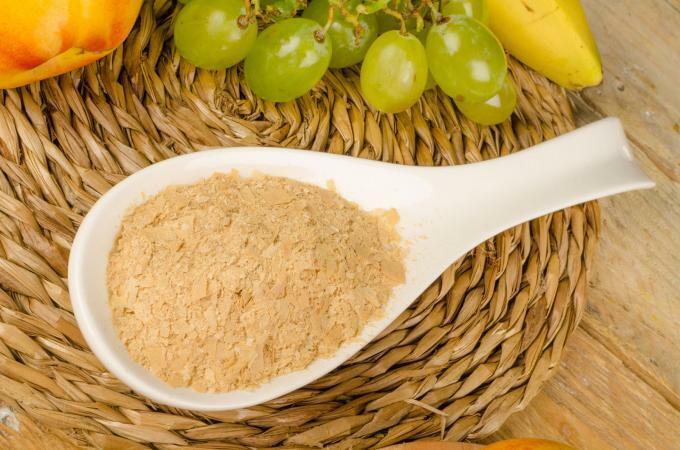 Adding brewer's yeast (distinctly different from baker's yeast and nutritional yeast) to your daily diet regimen may provide you with several health and nutritional benefits. However, this type of yeast isn't for everybody so always discuss your options with your doctor first.